The adoption of Google's Play Games collection of APIs and tools has been rapid, and very welcome among Android gamers - it's one of the first things that gets requested when a new title on the Play Store omits it. Now it's a little easier to tell which games support Play Games tools and which ones don't, without having to download them first. Users, including those of us here at Android Police, are starting to see a Play Games logo appear prominently in the Play Store app description of those apps that support the system. Earlier today, Kirill Grouchnikov, the face behind the Play Store Android app, detailed a set of relatively substantial design tweaks and RTL language support destined for an upcoming update. Unfortunately, the APK uploaded to APK Mirror shortly after did not seem to have the majority of these changes live just yet, but Kirill, who also announced his departure from the Google Play team, managed to sneak in one last parting gift. And it's the best gift he could have possibly given us. Or at least me, considering I copy changelogs all day long for APKMirror.com. I think I now owe him 100 beautiful white roses. Google has been making multiple changes to the Android Market recently, with the introduction of 6 additional screenshots, new promo graphics, YouTube video links, recent changes, and a whole new and refreshed Market app. It looks like they're not planning on stopping, as yet another, more subtle, update just hit the Android Market publishing interface, also known as the Developer Console. 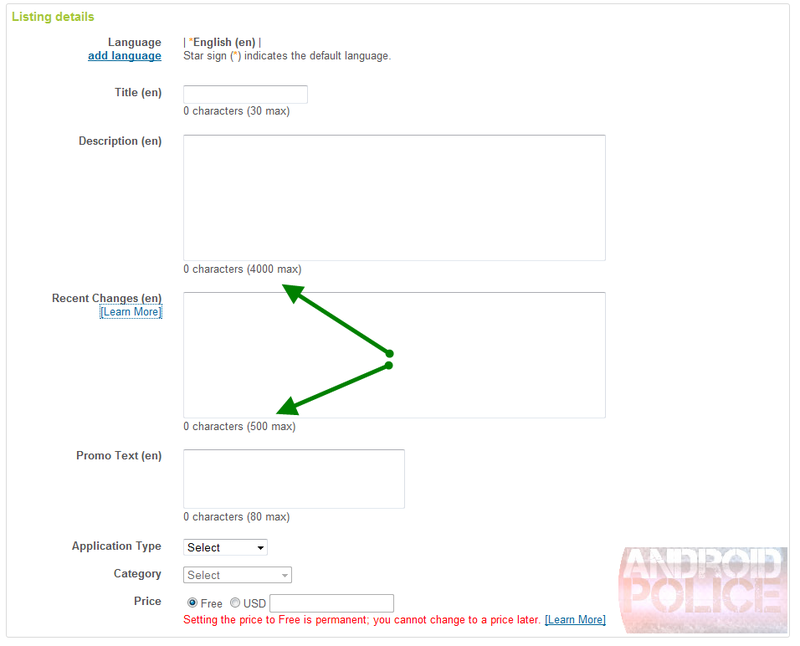 The new change expands the previously measly 325 character Description and Recent Changes fields to a whopping 4,000 characters for the Description and 500 characters for the Recent Changes. It looks like the number 4,000 wasn't chosen at random - application descriptions on Apple's iOS platform can occupy exactly this many characters.